Alexa has been providing meaningless data even before they were purchased by Amazon.com. Unfortunately people still reference Alexa data as if they were the holy all seeing manager of the internet. They aren’t, and therefore have unreliable data. It is easy to see why so many people (and even venture capitalists) want to believe in the Alexa.com data – it’s the only data we have. Compete.com has a similar internet traffic profile statistics program, and it will be interesting to see if they can deliver better results than Alexa. For traffic modeling sites such as these, in general the more popular a website is the more accurate stats are produced by these 3rd party programs. Here is a search that will bend your mind: try looking up Alexa on Alexa. It shows 0 results. Why? 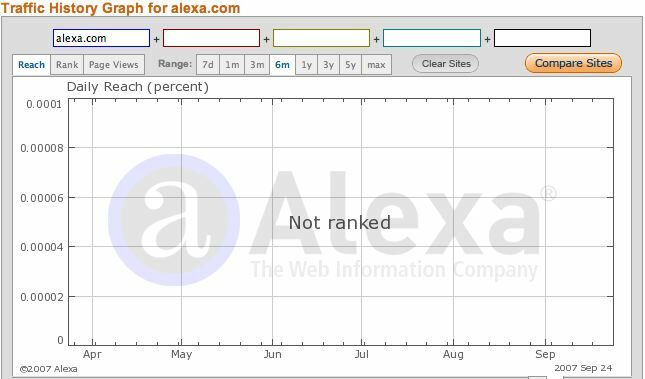 Because every Alexa user has the alexa toolbar installed by default and this would skew their results close to 100% internet reach, when in reality their installed base is closer to 1%. Alexa doesn’t work because of who will install it, and perhaps more importantly, who won’t. Let’s start with a place I’m very familiar with: Slashdot readers. Until recently Alexa didn’t work on Firefox… instead only IE users participated. On the internet as a whole that’s fine: like 80% of users run IE. But on Slashdot only like a quarter of you do. Read more and comment on the Alexa ranking mythology. What, who uses alexa to make website traffic decisions – google analytics is the program to use. Their data is meaningless if it’s so easily manipulated. Does anyone but advertisers give Alexa any weight anyway?